Water, water everywhere! That’s the goal when it comes to hydration in general but for watering systems specifically when trying to grow anything, indoors or outdoors. Let’s be honest, the memory being what it is who hasn’t wandered past their favorite plant and been shocked to realize that it hasn’t felt the touch of water in an embarrassingly long time. The same goes for the lawn. When hard summer sets in and there hasn’t been a cloud in sight for days the lawn is going to need water as badly as the average homeowner when they venture out into the blazing sun. Maybe more because on most lawns shade is hard to come by. When it comes to properly watering your plants or lawn, a properly designed watering system can ensure a beautiful landscape that individuals can enjoy all year long. Now that summer is coming we decided to perform an update on all our watering systems, so we can ensure that individuals are receiving a quality and top of the line water system for their lawn. With that said, we have also included the most frequently asked questions as well as the criteria that we used to handpick these top ten! That’s where watering systems come in. From full-on do-it-yourself sprinkler systems to simple tools, there are hundreds of products that are designed to keep your lawn, shrubs or indoor plants moist and dry during the worst of droughts or when vacation calls and you have to leave your plants behind. We culled through the mountain of products and picked our favorites of every kind including a little something for everyone. There are a few set-it-and-forget-it sprinkler systems designed to deliver water to an entire lawn. For indoor plants or outdoor shrubs, we’ve included some small drip systems and watering spikes. 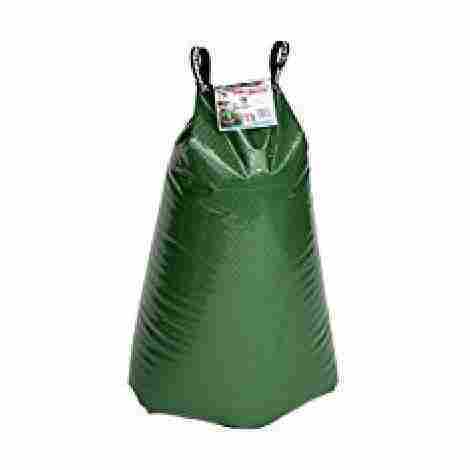 For trees we’ve got the best water bags that keep will keep your future shade trees damp for months at a time. So dig through our list and then rest easy knowing your plant’s health isn’t dependent on remembering to fill the watering can. Perfect for big gardens the KINGSO line comes with all the bells and whistles you need to keep your vegetables, flowers or nearly anything you can imagine well-watered and flourishing. The system connects directly to a hose and 82 feet of hose ensures it will get water to where it’s needed. The drip heads are fully adjustable and are also water savers. Each kit is designed to be custom assembled for each individual garden. Just cut the hose to any garden’s exact measurements, attach the drip sprinklers and then adjust them to hit the exact spot the water needs to reach. The 25 individual droppers carry water exactly where it’s needed but do so while using 70 percent less water than other systems of its kind. Attach it to any hose or faucet and simply turn it on for a set-it-and-forget-it watering system. The KINGSO is a solid entry and quite affordable for the amount of square footage it will water. There is some assembly required but the price makes this a great option if there is lots of room to cover. 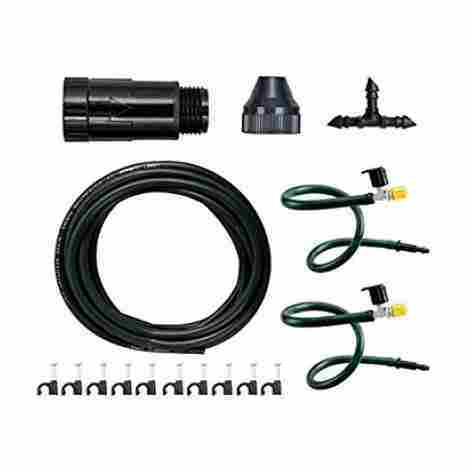 This full-service kit is the definition of set-it and forget-it and is truly a full-service watering system. A hook up to any hose? Check! 50 feet of tubing? Check. And the thing that puts this one over the top is the incredibly convenient timer that comes included with the kit. That makes this system the one you want if you want to make sure hanging baskets get the water they need, but without the overwatering that is somehow inevitable with systems that require manual starting and stopping. This special tubing holds its shape and allows precise placement of its six sprayers and then ensures that they stay where they’re supposed to. Barbed tees also help to keep the tubes in place. 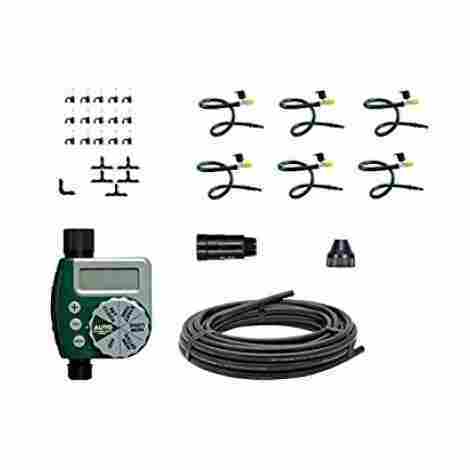 This handy timer allows exact control of every element of a watering regimen. Once you set the date and time with a simple turn of the knob set the start and top times, how often watering is needed and also has a handy rain delay setting that gives your plants a break. A bit higher on the pricing scale but this one has all the bells and whistles and the digital timer sets this product apart from a number of other competitors. The memory tubing and placement tees add to the value ensuring that the sprayers stay put. For the price, this is easily the watering system that gives you the most for your money. The Raindrip system has everything you need to water up to 20 pants exactly when you want to and saves water while doing it. It easily hooks up to an outside faucet comes with a digital timer and plenty of hosen to get just about anywhere there’s a thirsty patch or potted plant looking for moisture. This handy timer that comes included makes it easy to schedule not only the time and duration of watering but also includes a rain delay feature that easily allows users to take a day when the rainy weather makes watering unnecessary. Three of the greatest words in DIY history: “No Tools Required” make the Raindrop en even more attractive option in watering systems. There’s plenty of tubing and 20 watering spouts that make hooking up and programming the timer possibly the most difficult part of installing this system. This is our choice for best value and it lives up to the hype. There’s a lot going on in this product and it comes with the kind of low price tag that seems like a mistake. This is a high-quality product with a lot of add-ons that make it a real get for the price. It’s the little things sometimes that make the most difference. The water level indicator, or float stick that drops into the watering tube takes all the guesswork out of wondering when it's time to refill the bucket. Giving your plants water from the bottom up through wicking action makes it easy to extend the growing season almost year round by easily allowing plants to move inside and allowing watering without drips or spills. 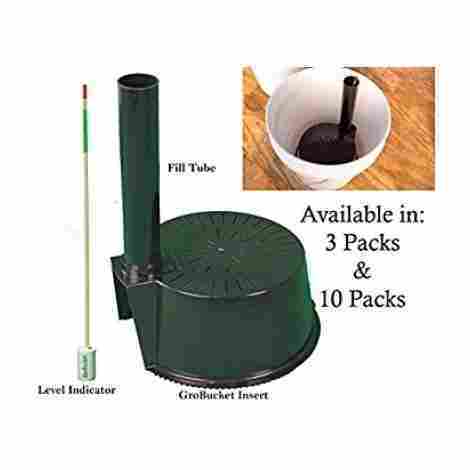 The Grobucket comes in about midway on the price scale but the kit comes with three buckets so it is a good option for gardeners who want to keep an herb garden or tomato patch in the green for a long time. The second Orbit product on our list but without a lot of the extras on our first entry, this is a much simpler do it yourself watering kit for a couple of plants. It’s easy to set up and place but doesn’t come with a timer or any of the other extras but for an outdoor vegetable or herb garden, this is the perfect product. While it doesn’t come with a timer this is a simple product for a gardener who’s not looking to set up a farmers market stand but just wants to keep a few plants or herbs healthy without having to worry about working at it. Thirty feet of hose is a lot of line for a two plant watering system. It just adds to the whole ease of use element of this Orbit product. 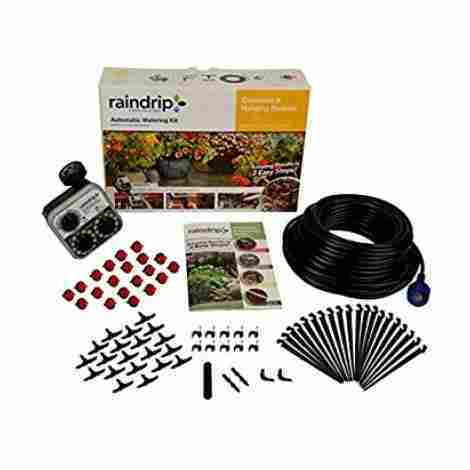 There likely won’t be any need to move your plants to the water and just adds to the “please make it easy” element of this drip watering kit. Hard to beat the cost of this product. For next to nothing, this drip kit will keep your tomatoes or herbs or flowering plants in good health with hardly any green thumbing. It does require a daily walk to the turn on and off the faucet but for the money that’s hardly too much to ask. These watering bags are usually a fairly constant fixture anywhere there are newly planted trees trying to make their way in the world. Simply put there isn’t any better product to keep young trees from feeling water deprived. The definition of Set-it and Forget-it simply wrap one of these bags around a small-ish (1-8 inches) trunk and fill it up with water. The bags deliver water directly to the root systems and generally will keep young trees moist for up to a week at a time. Thes bags hold a lot of water and they get it to the tree without any runoff or evaporation so it’s a great green choice. The bags are tough and will last season after season. Young trees need water at their roots to ensure a long life and a sturdy attachment to the soil. That’s why tree bags are important and in some areas nearly ubiquitous in public parks and in newly landscaped homes. Simply put they get the job done and give young trees the nourishment they need to survive and thrive. One of these bags can handle a young tree with a 1-4 inch diameter trunk, but for bigger trees (up to 8 inches) simply zip two bags together and the Treegator is ready to go. 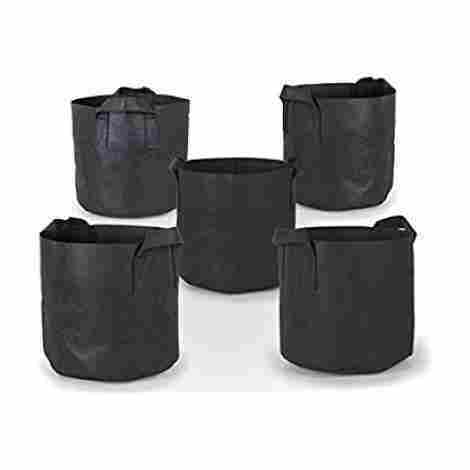 Putting two bags together also doubles the amount of water these durable watering helpers can hold from a maximum of 15 gallons, two, the two bag capacity shoots up to 50 gallons. These may seem a bit pricey for only two bags but think of these tree gators as durable goods. They’ll build to last so they’re a one-off purchase that’ll hold a long-term place in any gardening area even after your trees have outgrown these versatile tough tree bags. This is a great product if there’s a need to extend a self-watering system and it comes to an incredibly low price. But this is not a system so there will be a need to supplement with tubing and an adaptor if this is your first go at setting up a watering system. But once it’s set, there is 50 individual 360-degree watering spike, so it will easily cover a huge amount of space. The adjustable dripper also gives an element of control that other systems don’t have. 50 individual drippers allow this system to cover a huge amount of ground. And once its set flow adjusters allow exact placement and that means that every bit of ground that needs water is going to get it. These spikes don’t take up much space so it’s possible to place individual spikes right next to individual plants that need some love. And the adjustable flow allows even more precise control over where and how much water is hitting plants. This won’t put much of a dent in the wallet, but keep in mind that it’s not a stand-alone product. There are add-ons that will have to be brought to the point where these spikes can actually do their work, including tubing and adaptors, and placeholders. But in its favor, we’re talking 50 individual watering spikes, each one with a 360-degree watering range, and once they’re up and running that’s going to cover a whole lot of ground. Most fabrics grow bags that last season after season? Skeptical? Well according to the reviews we’ve seen these bags work great and stand the test of time. Simply fill them with soil and whatever you're trying to grow and let the natural aeration and ease of us do the rest. They’re tough, resilient and allow extra water out and lots of air in and that means healthier plants over the long term. Side handles also allow for easy movement. This is a great way to expand your garden without taking up much space. Despite their fabric construction these sturdy bags are designed to last. Simply clean them out and set them aside at the end of growing season and they can last for years. The handles are also built to stick around and allow easy movement of plants. If the value is what you’re looking for this is the way to go. Every order includes 5 bags and the price is next to nothing. And their resilience means they won’t need replacing for quite some time. A lot of product for a little bit of money. These ingenious little ceramic stakes will take great care of your indoor house plants without overwatering or underwatering for as long as a week. By drawing water slowly and steadily these stakes almost read the soil and apply water as needed, while slowly siphoning off water from a nearby supply. Each stake will last for up to a week and works by ‘reading’ the surrounding soil and never delivering more water than is needed. These stakes work very simply by delivering water to the soil until fully saturated and then it simply ‘turns off’ until the soil dries enough to start the process again. The stakes stay moist by siphoning water off of a supply placed near the stakes. 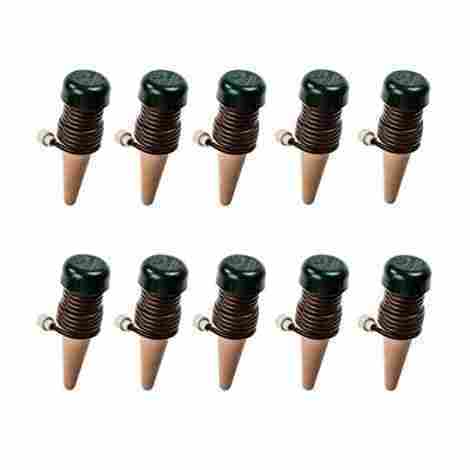 These ceramic spikes are manufactured in Austria of high-quality ceramic that will stick around for up to a week. A number of similar products can only be counted on to last 2 -3 days. They also come with a money-back guarantee if they don’t work as advertised. For a pack of five, these spikes are actually won’t take too much of a bite out of the wallet. They’re easy to set up and as long as the water supply holds out these little workhorses will deliver water as advertised for a long week away. 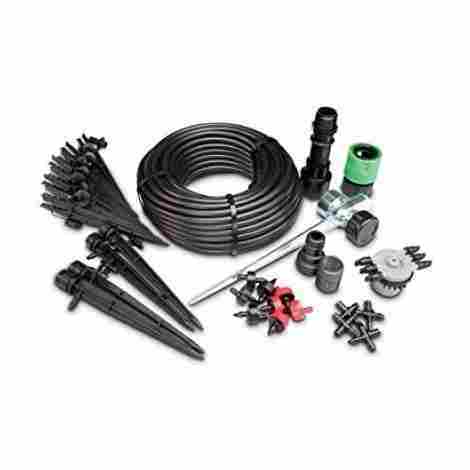 This is a great all-purpose kit that will provide directed water flow to between 15 and 25 plants. The big metal spike centers the hose and allows easy set up of the watering system that allows not only a few 360-degree watering spikes but also some localized drip spikes that will put water literally exactly where it's needed. There’s a lot going on here and there is some assembly required but once in place, this is a top-notch product that will keep your plants healthy, wet and happy through the hottest summer days. There is some assembly required but once in place simply turn on the water and let the Rain Bird do it’s the thing, delivering water exactly where it’s needed in a slow uniform way. The spikes throw water out in a 360-degree circle and the flow rate can be adjusted. As with most Rain Bird products, this can be part of a much larger system as these all work together. 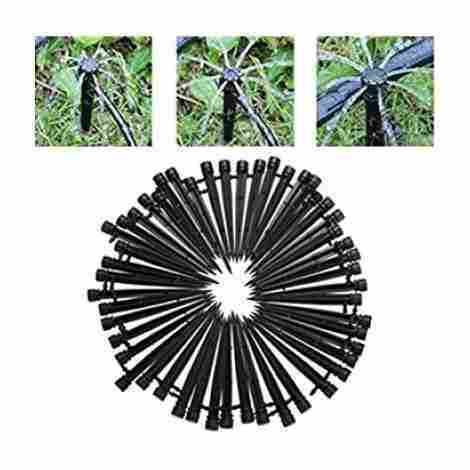 As a garden expands there’s no need to pull up stakes and reset, simply buy some extenders and without any trouble expand the system to cover more ground. A bit on the high end when it comes to price but this is still a great bargain for anyone who wants to get out of the business of standing in the yard with a hose every afternoon. These easily placeable and precise spikes take all the guesswork out of watering and once in place will do what they do during the long hot summer. Watering Systems are all about making life easier. For every gardener, every hobbyist of any kind the setup shouldn’t be so difficult and unwieldy as to make the setup more trouble than it’s worth. And once in place, they should just simply work, and the results should be evident in flourishing plants, robust veggies or trees and shrubs that take root and grow like the wind. Most of these products take that need into mind and hopefully with very little setup time you’ll be able to sit back and watch your plants grow with vigor during the hottest summer days. There are lots to choose from here to find the product that hits the gardening sweet spot and watch the water do its work. When it come to picking out the best watering system for your plants and flowers, it’s incredibly important that you take the appropriate measures to ensure the absolute best product. For one, if you are not careful and you purchase a product that is cheaply designed, not only could it prevent your plants from growing properly, it could also cost you a fortune down the line. Reason being, there are so many different watering systems and many of which are not energy efficient. Knowing this, we needed some standard or measurement tactic to use to assess each of product in contention. This is where we would like to introduce the next part of this buying guide: Criteria For Evaluation. This section is intended to inform our readers specifically how we were able to highlight the very best products in this industry. If you are curious, we created a list of important criteria and standards to represent what would be most important in selecting the best products, alongside what was most important to our readers. So, without further ado, let’s start with the first criteria: quality! If this is your first time picking out a watering system, you should know that the single most important aspect of a watering system that you must take into consideration is the actual quality of the design. The truth of the matter is – there are so many different brands and companies out there and, some of them, have made less-than decent product. In this, the watering systems are faulty, leak water from the pipes or tubes, and are not water or energy-efficient, costing the owner more money than the system itself. With that being said, when we began this buying guide, we started off by looking at each product to understand how it was constructed. This entailed studying the materials used, the different durability mechanisms, and the technology used to help water plants. From here, we really took into account what previous customers said in their reviews regarding the quality of the design. We wanted to know if the tubes were designed from higher quality materials or how efficient the product actually was. Let’s be honest, are you looking for a watering system that is high-quality and difficult or challenging to install, or one that it’s simpler and perhaps a one-two step kind of deal? This is more of a rhetorical question because no one wants to spend hours trying to read manuals or instructions. With that being said, when we were picking out the best watering systems for our readers, we made sure to look at how easy the system was to install, and whether or not the common garden guru could install it. Now, typically, when it comes to installation, manufacturers share some information for new customers to offer some insight. However, as we have learned from other experiences and buying guides, it’s important to cross-reference this information. So, what we did was scan through a wealth of different customer reviews to secure that each water system that made our list was not challenging to install. Now, since these products really rely on your water pressure and water system in your home – we wanted to make sure that, no matter the product that you purchase, the manufacturer designed it to be water efficient. Today, many companies have gradually joined the energy-efficient model because it has become a trend among consumers. So, to gauge the energy efficiency of a watering system, we needed to really look at how the manufacturer talked about efficiency in their product description. Typically, the best companies out there are proud and share their insight in how they can help save a homeowner or garden guru some pennies when trying to water their favorite plants or flowers around their patio. Now, if we did not find any direct information, we did take the time to do some extra research to consult with other experts and previous customers in the review section. The cost and value is one of the best and quickest ways for a consumer to figure out whether or not they are going to get their money’s worth for a purchase. So, to measure the cost and value, we took the time to scan the entire market of watering systems to figure out what companies were charging for their products. From there, we took notes of different price points to notice any differences between brands, the highest and lowest price tags, and what the middle ground of the market was. Understanding this, we were able to draw some conclusions as to competition and pricing scale. Now, to figure out the value aspect of the equation – we looked at each product and attempted to answer the question: what value does this specific watering system offer a consumer? As we drew different valuable aspects, we kept into consideration the price point for the product, in comparison to other competitors and their cost and value. In doing this for dozens of products, we were able to pick out the top 10 products that offered the most value for the best price tag. Have you ever purchased a product before and, after using it once, it just broke? It has happened to all of us, at least once, right? Well, when we were picking out the best watering systems for your consideration, we wanted to make sure that each product was designed to last. So, whether you went hiking, camping, or traveling – your plants could still prosper without fear or worry. To assess this, we looked at how manufacturers were assuring their consumer base. Typically, these companies would offer their new customers warranties or guarantees in case of a product malfunction or a piece breaks off. Additionally, companies might also take the time to use higher quality and more durable materials for the tubing or other parts where other companies may use only plastic materials. Whatever the case may be, we can say that each product that made our list today was designed for your peace of mind. Q: Do you need to winterize a watering system? A: As one of the most frequently asked questions, we can see why this is one of the most asked questions on the list. For individuals that live in cold climates, winterizing a watering system is crucial in the winter. The first task is to properly shut off all of the water supply and better yet, disconnect it from the main water connection. With that, individuals should properly cover and protect the system because areas of the hose or the openings may be subject to cracking and subject to other problems. Q: Can you use a watering system for potted plants and flower or hanging plants or flowers? A: Yes, but it all depends on what watering system an individual uses. 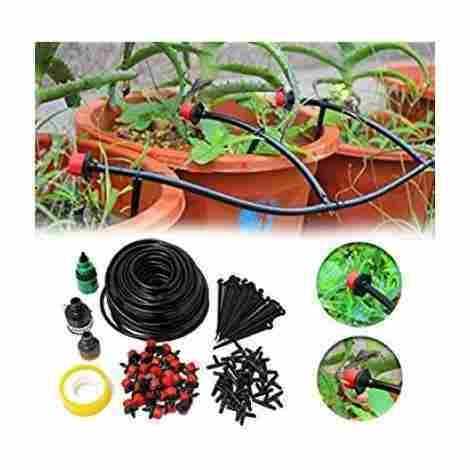 With that in mind, the best water system for potted plants and flowers is a drip irrigation system or some kind of hose system that waters the flowers and plants automatically. With that, there are automatic watering systems that release the water at certain periods of times through the day, etc. For this, it is better for individuals to take into consideration how many plants or flowers they seek to water so they can pick out the best watering system, hose, and other important factors. Q: How do you clean out a clogged system? A: When it comes to cleaning out a clogged watering system, this is one of the most frequently asked questions for many reasons. When an individual wants to clean out a watering system there are many different ways to do it. Primarily, an individual will need a lot of hot water. However, the organic way to clean the clogged system is hot water and vinegar which adds as an acidic particle separator which can destroy the clog. However, there are also many different products that an individual can buy to unclog a system. Q: How do you know if a watering system is great for a smaller or larger garden? A: This all depends on the individual and the square footage. With that said, the best water system for a certain type of space is dependent on the space, the type of ground an individual as if they have potted plants and other factors. Therefore, it is always best to ask a professional and take into account what type of watering system an individual’s needs. Q: Do all parts come with a watering system or will you need to purchase extra parts? A: As one of the most asked questions, we can see why individuals ask this question often. The primary reason is that it is important when setting up a watering system if you have all parts. However, it can also get costly. With that in mind, this all depends on the maker and the style of watering system. Some systems do require more parts, depending on the square footage of the area an individual wants to water. With that in mind, we highly recommend that individuals take into consideration buying extra pieces in case a part of the watering system breaks or rips.